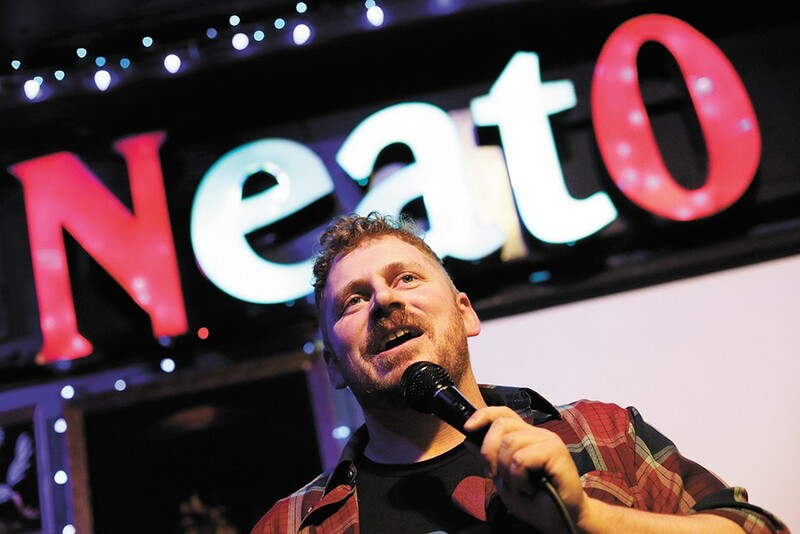 Funnyman Casey Strain is the host of the open mic night Guffaw Yourself at Neato Burrito. His comedy career started seven years ago beneath the Tilt-A-Whirls of Spokane's meticulously curated junk bar, Zola. Casey Strain entered his first variety show as a comic, not knowing how excruciating 10 minutes on the stage is. He told a story about pooping his pants while walking home from the bar. His parents were in the crowd. He told jokes about the saving grace that was a newspaper to a barroom audience, typically comprised of business professionals who just want to dance. "I didn't know what the hell I was doing or how 10 minutes feels like an eternity if you've never done it before," he says, trying to remember the details of a story he's not sure he wants everyone to know. Today, Strain is commanding on the stage and is a fixture in Spokane's comedy scene. He has an unprecedented casualness and likability. He's self-deprecating yet overly confident as he reacts — often in the most peculiar ways — to the world around him. He's the host of the city's longest-running open mic night, Guffaw Yourself at Neato Burrito, and can be seen hosting at the Spokane Comedy Club or performing twice a night at open mics across the Inland Northwest. When he's not working out new material at open mics, he's hosting a live recording of his podcast Weed and Whiskey or producing comedy showcases at venues like The Bartlett and the Big Dipper. "My material has progressed past pooping my pants," he says, referencing everyday stories about riding the bus or obscure movies from 1987. "Somehow I think I come across sexier than I should. ... Maybe readers should pick me as the most eligible bachelor in the poll next year." He rolls burritos by day and tells jokes by night, but is the same red-headed man with cherub-like curls and an affinity for dancing. There's no persona on or off the stage — yet there's a dedication to his craft. He writes jokes in a small notebook that fits in his pocket. He dedicates hours each week to writing material that will be heard across Spokane's stages and in bigger markets across the Northwest. In his back pocket, he has stories about pooping his pants. "I've screwed up a lot and I think it's funny," he says. "I think other people can relate to that on some level." The original print version of this article was headlined "Best Local Comedian"